Great wall of china Facts. Often shrouded in mystery and rumor, most people are interested in learning facts about the Wall of China. Questions such as how long, how tall, how wide, and how old are not always easy to answer because it varies so much. The Great Wall of China was built over a period of several years, varies in height and width, and long buried sections are still being uncovered. Great wall of china facts. The history of the great wall of china. The first sections of the great wall of china were built around 770 - 476 B.C and was built and maintained over eleven centuries. 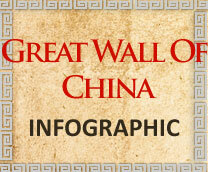 Find out more about the history of the great wall of china. The best places to visit the great wall. What are the best places to visit the wall of china, what other attractions are near these places. The best places to visit the great wall of china. Great wall of china photos. The great wall of china info. It is considered one of the greatest engineering feats ever accomplished. Built as a defense against nomadic invaders from the north, the Great Wall is now a vital part of China’s tourism economy. Like the dragon symbol of China, the great wall of china slithers through grasslands, deserts, over plateaus, and mountains. Famous parts of the wall display an incredible variety of scenery which tourists enjoy through the full length of the journey. The wall climbs and descends through gorges with rivers below and spectacular scenery. Panoramic views of picturesque lakes and dramatic mountain vistas mark all aspects of a walk along the wall. 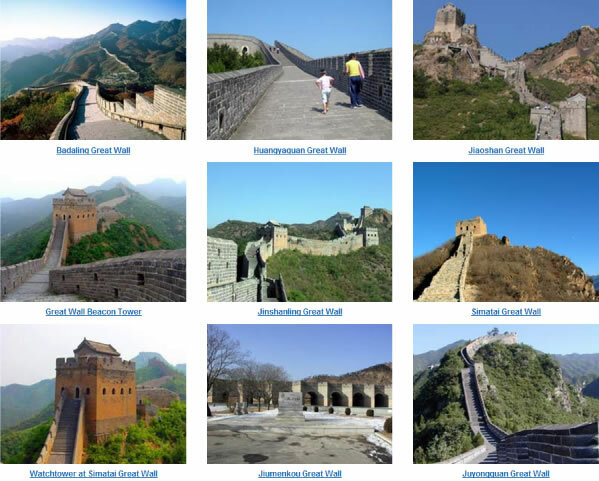 The Great Wall sets a grand architectural standard and displays undeniable historical meaning. In 1987, UNESCO, designated The Great Wall of China as a World Heritage. Then in 2001 a Swiss corporation, “New7Wonders Foundation”, started an initiative, choose the New Seven Wonders of the World. The Chinese government and people were proud to have The Wall make the list of seven. The portion of The Great Wall that exists today was mostly constructed during the Ming Dynasty (1368-1644.) These parts of the wall begin in Hushan in the east, crossing through Liaoning, Hebei, Beijing, Tianjin, Shanxi, Inner Mongolia, Nigxia, Shaanxi, Gansu, and Qinghai, ending in Jiayuguan Pass to the west. The Badaling section of the wall is considered the most representative part and is the best preserved section of the wall. This section is located 43 miles north of Beijing, China and is easy to reach by bus or taxi. The Badaling section is the most popular with tourists and draws close to two million visitors each year.